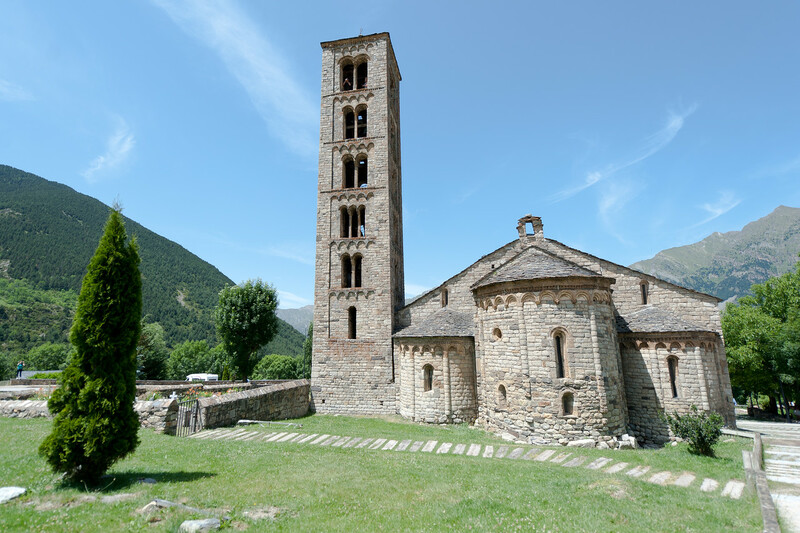 The churches of the Vall de Boí are an especially pure and consistent example of Romanesque art in a virtually untouched rural setting. The group of churches is a remarkable example of an important constructional style in human history, like that of Romanesque art, to which it contributes characteristics that are appropriate to both its religious and its secular aspects. The Vall de Boí illustrates the continuous occupation of an area of land. The churches that were built in the Middle Ages at the instigation of a single family symbolize the affirmation and geographical settlement at the time historical Catalonia was created. The Vall de Boí is screened by the high peaks of the Beciberri/Punta Alta massif, in the high Pyrenees. Its scenery is one of woodland and meadows, adjoining and surrounding the small villages. The Arab invasion of the Iberian Peninsula never penetrated the valleys, but they were exposed around the beginning of the 2nd millennium to cultural influences, brought there by merchants, by itinerant monks and by Christian pilgrims traveling to Jerusalem and Santiago de Compostela. In the 11th century, new cultural styles were brought into Catalonia from Italy, particularly Lombardy. This new cultural movement was late in reaching the remote Vall de Boí. The exceptional number of Romanesque churches in the valley is attributed to the fact that large quantities of silver came into the region. The Vall de Boi isn’t hard to get to but you do have to go out of your way to get there. 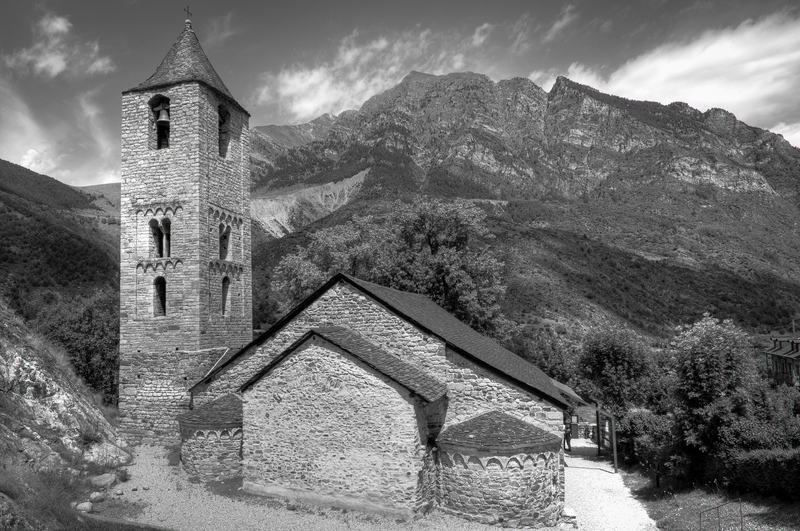 This site is a collection of 10 12-13th Century churches which reside in the small villages of the Vall de Boi. The churches, like many in the Catalonian region, are of a Romanesque design. In fact, I saw many churches throughout the Catalonian Pyrenees which were very similar in style and age to the churches found in the Vall de Boi. 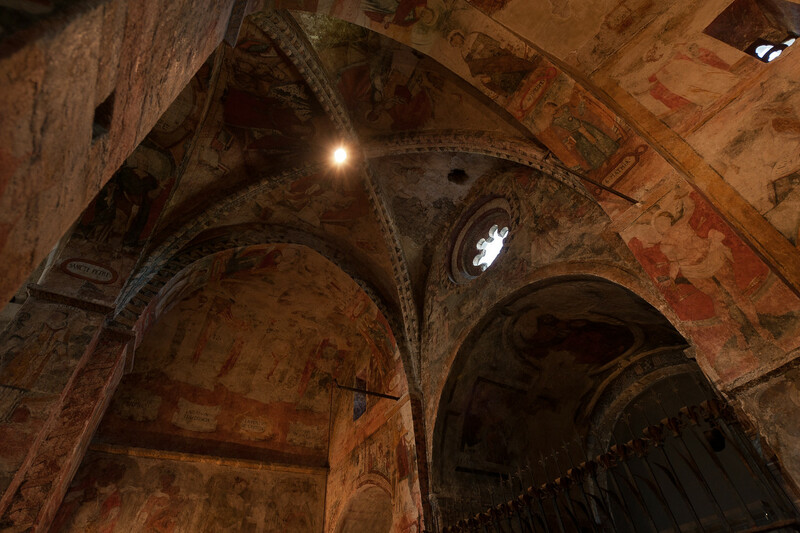 Beyond their architecture, what makes many of the churches special are the frescos which can be found inside. Most of the frescos have undergone or are undergoing renovation. If you visit the Vall de Boi, take the time to visit Aigüestortes i Estany de Sant Maurici National Park. It is a beautiful Pyrenees park easy driving distance from the Churches. These Romanesque churches are set against the beautiful Pyrenees Mountains in Spain. Furthermore, they were built during the 12th century. This Roman Catholic Church is one of the 9 Catalan Romanesque Churches of the Vall de Boí. There are no definitive records that will indicate exactly when this church was built although the experts assume it was in the 11th century. The original plan for this church was similar to the other Catalan Romanesque churches but this one did not follow that construction plan. It is known for its unique nave that covers a barrel vault. Inside the church, there is a triumphal arc dedicated for the choir. This is another Romanesque church located in the province of Lleida in Catalonia, Spain. It features the largest collection of architectural elements retained by this church from the time that it was constructed in the 11th century. This church is also located at the entrance to the village of Boi. This church from the collection of Catalan Romanesque Churches of the Vall de Boí is located at a commune in the valley of Boi. 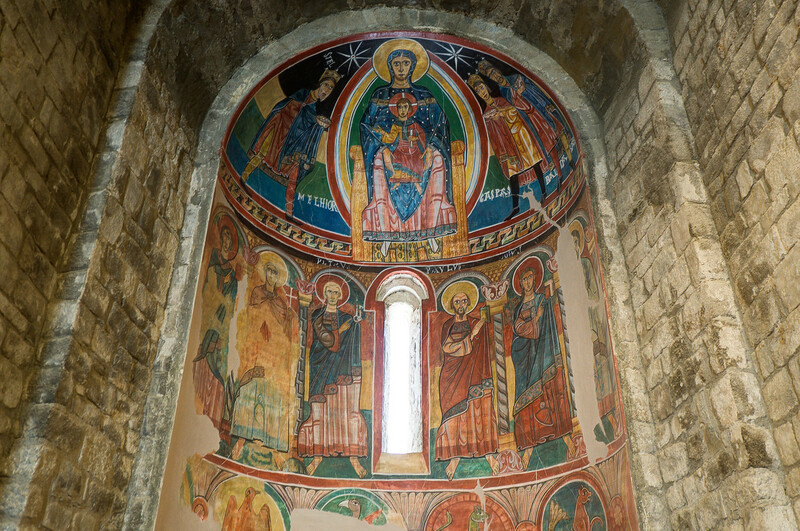 The architectural elements found in Eglesia de Santa Maria, Taull are typical of a Catalan Romanesque Church such as chevet, apse, left apse, nave, and reredos. There are also several wall paintings all throughout the secular building. The famous paintings include that of Gaspard and Baltazar, Apostles, Melchior, and the Adoration of the Magi and Mary at the central apse. The Church of St. Clement of Tahull is a Roman Catholic Church that features the Romanesque architectural style along with Romanesque art. This church officially opened in 1123 and was consecrated by the Bishop of Roda-Barbastro in Vall de Boi. Aside from its use of Romanesque architectural style, it also takes influences from Byzantine and Lombard styles. This is also known as the church of Assumption, which is one of the nine Catalan Romanesque Churches of the Vall de Boí. This church is known for its single nave with a barrel vault and square bell tower. The church is also made with two floors and the second floor is made for holding the bells. This church was built in the 13th century. The Church of Santa Maria, Cardet is located on the slope. For this reason, the apse of this church is located at a higher level as compared to the central nave. The church is made of small dimensions. The Eglésia de la Nativitat, Durro is located at high altitude, up to 1,386 meters. The exact location of the church is in the town of Durres. The initial documentation of the church is in the 11th century; hence, the experts are the ones suggest that it was also built during the same time. Second to the last in this list of Catalan Romanesque Churches of the Vall de Boí is the Ermitage de Sant Quirc, Durro. It is a small hermitage church with simple architecture. The church’s nave is built with a barrel vault and features a presbytery. The entrance door to this church also features arches with voussoirs. It lacks the large windows you will normally find in churches; in fact, it only comes with a porthole and small openings on the western façade. In 1962, the Eglésia de Santa Eulàlia, Erill la Vall was recognized as an artistic and historic monument in Spain. The building is known for its single nave and semicircular apse. Meanwhile, the exterior side features a portico with cylindrical columns. Finally, it features a bell tower that comprises six stories with a height of 23 meters.